Vickie Kerr has always been passionate about preparing nutritious meals for her family, and it was her desire to make a healthier snack for her four young children that resulted in the recipe that launched Miss Vickie’s Chips, one of the most successful potato chip brands in North America. Now, after more than thirty-five years preparing food for her family in her kitchen, Vickie Kerr has written her first cookbook. Miss Vickie’s Kitchen is both a collection of recipes and the story of a family legacy spanning decades. The book features more than seventy recipes, from healthful salads and sides, to delicious entrées, hearty soups, and comforting casseroles,through classic desserts and preserves. Beautifully designed with full-color photographs, it offers instructions that are so simple and straightforward that even the newest cooks will feel confident getting into the kitchen. Also included are Vickie’s family stories, photos, and anecdotes that are sure to inspire readers to gather loved ones around the table for a meal prepared with their very own hands. 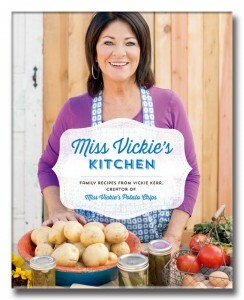 Every book ordered from MissVickiesKitchen.com is signed by Vickie with the option for a personalized message. Would it be possible to get a signed autographed book from Miss Vickie ? Hello! Thanks for your comment. I’m going to meet as many people and autograph as many cook books as I can this fall! Miss Vickie, I heard you on CJAD yesterday morning. I’m sooooo glad to meet you virtually. Believe it or not, I’m a health/fitness buff and OMG, you’re chips – Pepper & Lime – ARE THE ONLY CHIPS I absolutely go crazy for!!! And I didn’t know you were from Montreal!!! OMG! I hope to get to one of your book signings. I’m a huge foodie, love recipes and anything and everything the healthiest possible. You’re my idol! I always wanted to do something like you have achieved – starting out with such a simple/healthy concept! Congratulations! Well done! And recognition well deserved!! WOW! I’d love to work for such a company!!! Sooooooo interesting! Food!!! Hello, we are the students doing a class project on your invention of Miss Vickie Chips, we were hoping you could answer a few questions for us. Thank you! 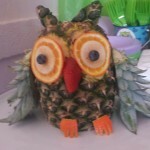 Hi Melissa, Thanks for visiting my site! HI Thanks for visiting and taking the time to say hello. Thanks for building such an amazing house. We couldn’t love it more! HI Happy to hear from you…We had to build that home after our farm house burned to the ground in 1986 -just a short time before we started making Miss Vickie’s chips on the farm. In this video, Vickie demonstrates how to make potato chips at home. Thinly slice the potatoes on a cutting board with a sharp knife. The slice should be thicker than what a commercial slicer produces. Try to create a uniform slice thickness so the potato chips cook evenly and completely. In a heavy pot, heat the oil to 375°F–380°F. Continually check the temperature with a cooking thermometer. Drop one potato slice into the hot oil. If the slice begins to cook rapidly, bubbling around the edges, the oil is hot enough. If the oil temperature is too low, the potato slice will absorb the oil. 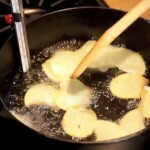 Carefully add 1 cup of potato slices to the oil. Stir gently to prevent the slices from sticking together. Cook until golden. 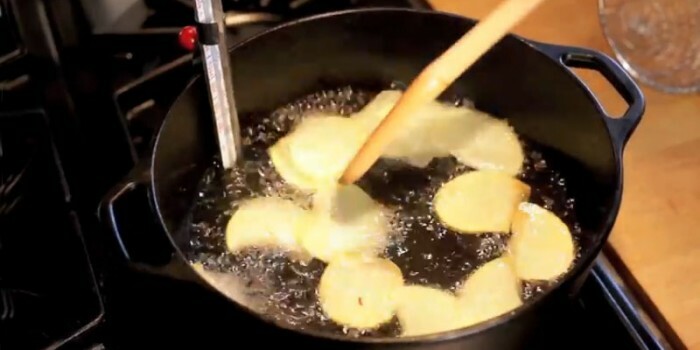 Remove the chips from the oil with a slotted spoon and drain on a paper towel. Sprinkle with sea salt while still warm. Continue cooking small batches until all potatoes are cooked. o TIP Make sure to find the right type of potato for your chips. There are many different varieties of potatoes. Some are grown for table use—boiling, baking, or frying—while others are grown specifically for food processing. Chip-stock potatoes are low in sugar content and high in dry matter. They are grown to produce “white” potato chips. Chip potatoes aren’t normally found in the supermarket unless a chip-stock grower has an oversupply. Early crop potatoes, like those in spring and summer, will usually cook to a light golden colour. Unless you prefer dark potato chips, don’t purchase potatoes with yellow or gold-coloured flesh to make potato chips. Try using round white table potatoes. Such a simple, tasty recipe! Good morning. Thank you for this wonderful recipe. Potatoes are my favourite thing to cook. I will use this for sure. All the best to you and your family over the Holidays. I saw you on Breakfast Television this morning and will be liking you on Facebook and will be passing along your website information and the information about your new cookbook. Thank you for your letter. If you have any questions, please contact me..
Last night I was thinking about snow and my warm farm kitchen from years ago. 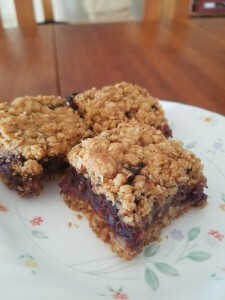 I remember baking my first pan of date squares, there, especially because my son, Liam loved them. 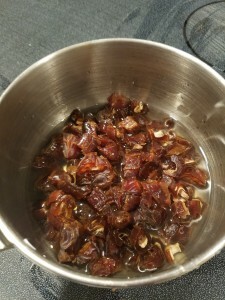 Dates don’t grow in Canada, but delicious date squares were a staple at family gatherings and celebrations in our part of rural Ontario, north of Toronto. Simmer 8-10 minutes. until dates are soft. Add baking soda and after the froth settles, mash with fork . Cool 5 minutes and stir in vanilla. Cool while preparing the crust. • In bowl, blend flour, baking soda, and salt. 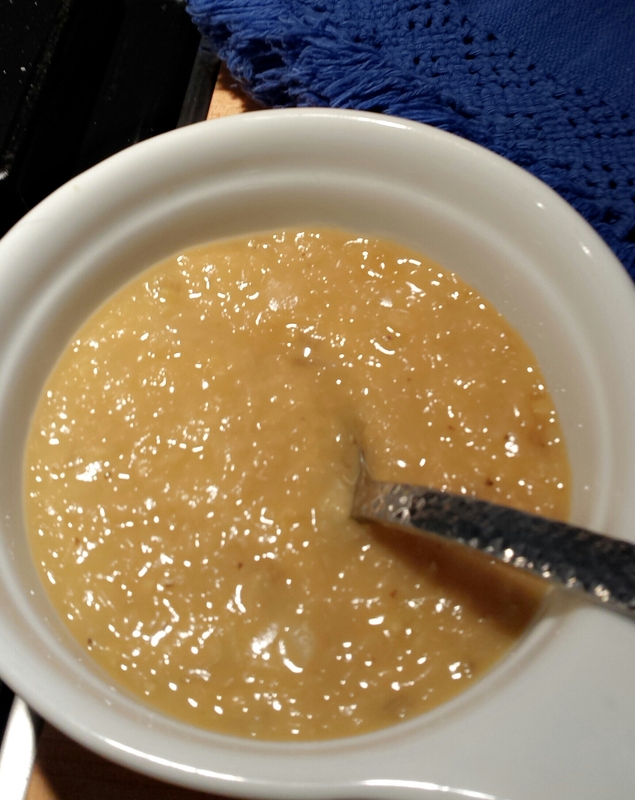 • Stir in brown sugar and oats. • Cut in butter with pastry cutter or fork until mixture resembles coarse crumbs. • Press half of crumb mixture over bottom of lightly buttered 8×8-inch pan to form bottom crust. • Gently spread date filling over bottom crust. • Sprinkle remaining oat mixture over date filling. • Lightly pat with palm of hand to even out. • Bake on middle oven rack for 25 minutes at 350 degrees. I’d like to share the jam recipe that I make for my friends and family. It’s on page 116 in my cookbook, “Miss Vickie’s Kitchen.” If you decide to order a book from this website I will personally sign and dedicate it to someone special – just in time for Mother’s Day. Have the children or grandchildren help make this delicious recipe. Making jam together in berry season can become an annual family tradition! 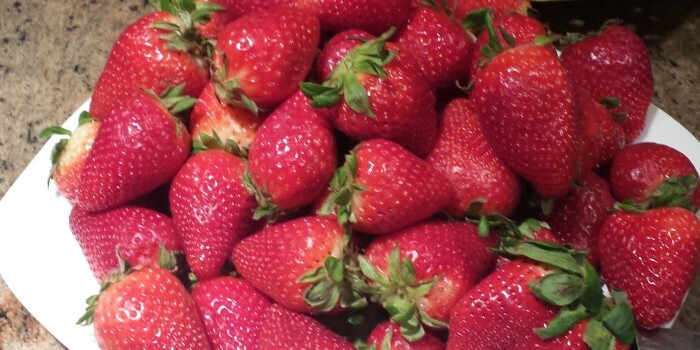 Allow berries to ripen at room temperature before preparing. 1) Rinse and hull berries. Cut out and discard any white pulp from inside the berry. 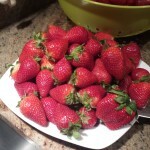 Slice berries into quarters in large mixing bowl. 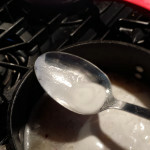 4) Use a wooden spoon to stir in sugar, adding slowly, a little at a time. 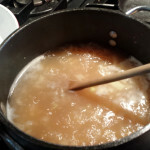 5) Continue to stir until all sugar is dissolved. Skim away any foam and discard. 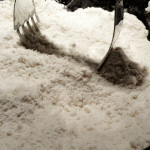 To dissolve sugar completely try leaving the bowl on the kitchen counter and stir a wherever you walk by. Scrape down sugar from sides of bowl often. If the sugar won’t dissolve, cover and leave overnight. In the morning stir until all sugar dissolves. 6) In a small bowl mix lemon juice and liquid pectin well. 7) Add liquid to berries stirring continuously until completely blended. 8) Ladle into sterilized jars and set lids on lightly. 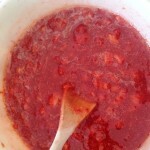 Allow jam to set 24 hours on the counter then check that the jam has set before sealing and freezing. Freeze for up to 6 months. 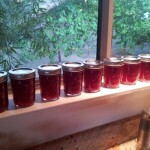 I have a question though, my daughter and I made a batch of jam today……..before seeing your recipe however. There is a layer of sugar in the bottom of the jars……..what can I do to fix this? 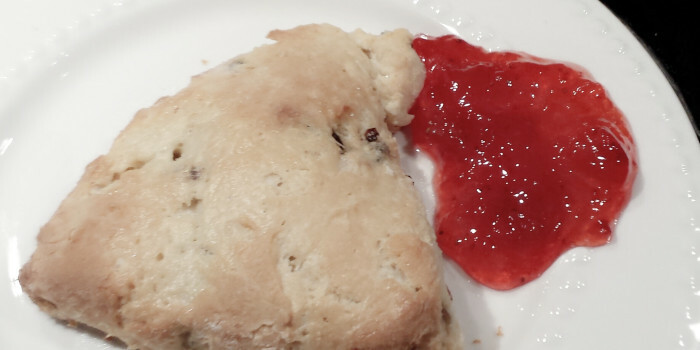 I was going to re-process the jam…..even though I already added the pectin. Today I had the urge to create a satisfying dish complete with meat and veggies, but without spending a lot of time in the kitchen. 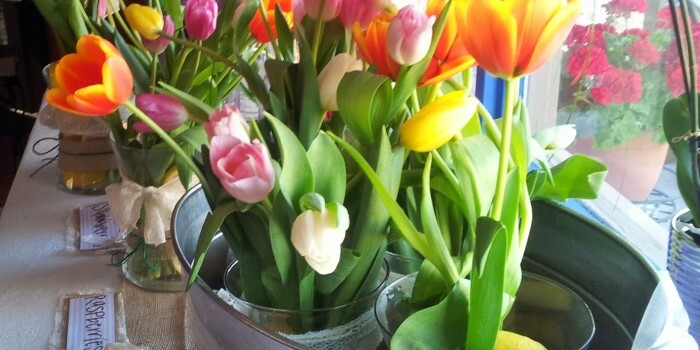 I love my kitchen and I feel creative there, but today I felt like I needed a change, so I decided to spend the Spring day, with its lovely mild temperatures – entirely outside the house enjoying the sun with my family. I wanted to cook, too, though, that was my dilemma. 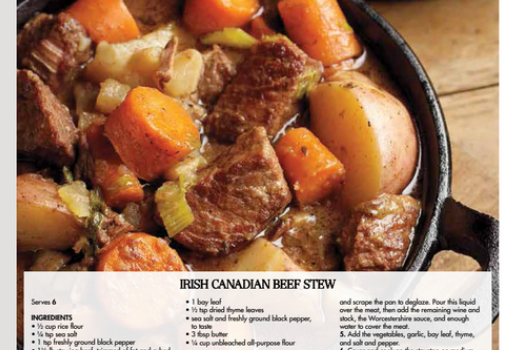 I looked to my cookbook, “Miss Vickie’s Kitchen”, for inspiration and found it on page 46 – my recipe “Irish Canadian Beef Stew,” pictured below. 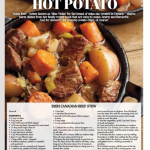 It was featured in Entertaining and Lifestyle in March 2015 issue of Hello Canada! I turned on my slow cooker, browned the beef, chopped the veggies, placed it all in the pot and covered it with water, wine and beef stock. I set it to 6 hrs on low heat and then drove to the park to play with my granddaughter. Watching her smile on the swing while my daughter pushed her, brought back memories of me pushing my little ones on swings many years ago in a playground miles away, in small town Ontario, Canada. It was a sweet moment to cherish because it reminded me that life is a circle and, although we sometimes think our lives will never change, they will change and they DO change. Change can come in an instant. Sometimes change takes a slower, more subtle course. But life is about change. The more years that pass, the more we should welcome and embrace change. When I look back I can truly treasure the moments spent playing with our children when they were small or sharing a tender moment with a loved one. I held my giggling granddaughter’s tiny hands as she slid down the slide, I remembered that only a year ago she was a newborn infant. Change comes whether we are ready or not! I suddenly realized it was almost suppertime, so we gathered our things and headed home, tired and hungry but mentally and emotionally reconnected, renewed and refreshed. Now back in my kitchen, the slow cooker had been doing all the work while I played the afternoon away and the beef stew was ready and waiting…6 hours later. “A change is as good as a rest”, was one of my Bill’s favourite sayings. Maybe there’s a lot of truth in that. 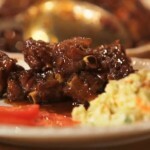 Set slow cooker to low heat for 6 hours. This Easter Sunday my family will celebrate the joy of the season by coming together at my home to share brunch. We are all looking forward to welcoming two of my cousins and their wives from England and Canada who will join us! My daughter and I planned the menu all week. She will prepare her signature guacamole dish, (recipe on page 7 in my cookbook) and a new favourite drink, Sangria Punch- Arizona style. My eldest son and his wife plan to make the Crepes Suzettes, my personal favourite. My middle son is handing all the crucial Canadian bacon-related details. My youngest son will make sure we have Grand Marnier on hand for the crepes as well as guarantee lots of fresh picked pink grapefruit for the juicer. Fresh squeezed juice for 14 guests! Delicious..
A pint of Quebec Maple Syrup stands ready for the pancakes! I remember when I used to handle all the planning and cooking details for every family get- together, but I discovered that it’s more fun when the entire family gets involved working together and creating in the kitchen and I can take a step back. It’s such a joy to share my little kitchen with all the accomplished “cooks” in my loving family. Oh..I almost forgot…Yes I’m planning to make a little something, too. 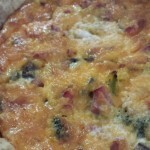 The Quiche recipe I prepared for Vera’s Birthday party was well received – so I’ll make it again! This time I’ll prepare it the night before and serve it warmed up or cold for brunch the next day. Line an unbaked 9 inch pie shell (pastry recipe Page 104 0f Miss Vickie’s Kitchen) with pie weights or tin foil so it doesn’t bubble. Bake shell at 425F until almost golden, about 15-18 minutes while you are preparing the filling. Remove tin foil after 10-12 minutes and continue baking until the pastry looks almost cooked. The pastry should be warm when you fill it with the egg mixture. Cook the bacon until almost crispy. Set aside on paper towel to drain. Sautee the onions in the bacon fat. Crumble bacon when cool and transfer to bottom of the baked warm pie shell. Add the onions and the fat to the bacon. Add broccoli and mushroom slices. Sprinkle cheese over the bacon, broccoli and onion. Add salt or pepper here to taste. In a medium bowl beat eggs, cream and seasonings. Pour over the bacon & cheese. Reduce heat to 325 degrees F and bake for 30 minutes more, or until a knife inserted comes out clean. The center of the quiche should still look a bit wobbly, but it will continue to cook for after it’s removed from the oven. Cool ten minutes before cutting into pie shaped wedges. I love to cook and bake, so when my daughter planned a BIG birthday party for my firstborn granddaughter in March I offered to help with the menu for brunch. Vera turned one year old and the theme of her party was to be owls. 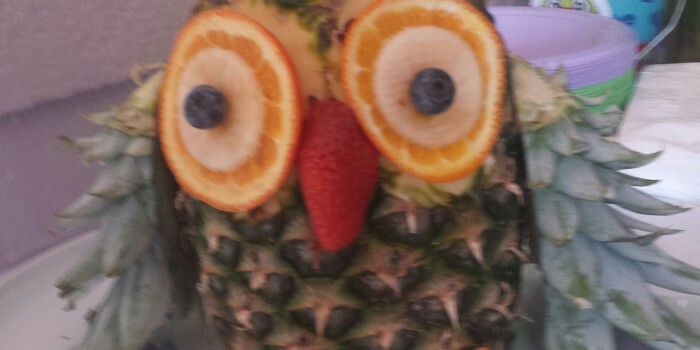 I always prepare Deviled Eggs (recipe on page 8 in my cookbook) for family get togethers, but this time my daughter requested I make the eggs look like owls! Slice each egg in half and remove yolks and mash well in a bowl, adding enough salad dressing (like Miracle Whip) to make a thick paste. Season yolks with dry mustard, salt, pepper. 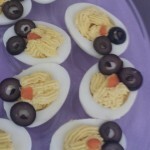 Fill the egg white halves with yolk using a pastry tip to resemble feathers. A tiny triangular carrot slice creates the beak! The children and adults loved it! If you’ve had enough of munching down fatty chicken wings watching the game, try a Super Bowl Sunday gourmet recipe made from scratch that’s easy and foolproof! Serve as a roast or make French Dip sandwiches everyone in your family will rave about! 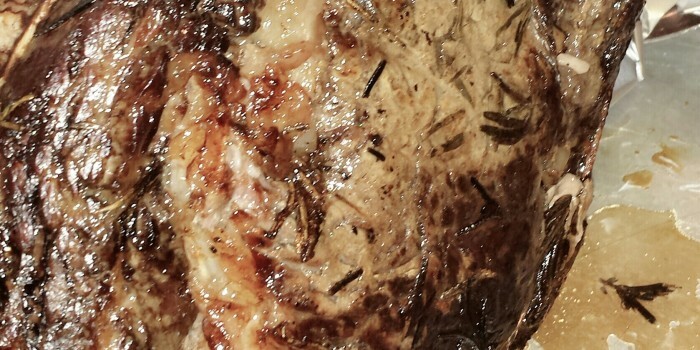 At our home we usually reserve this recipe for very special occasions because of the price of prime rib beef, but we’ve found that any standing rib cut of beef cooks to perfection if you follow these simple steps. You will need an accurate meat thermometer to do it just right! Bring a 6-8 lb standing rib roast (2-3 bones) to room temperature. Place the roast bone-side down in a roasting pan. Remove roast from pan and cover completely with foil. Allow roast to rest for 15 minutes while preparing au jus. The roast will continue to cook. Simmer over low heat, whisking occasionally. Reduce to 1/2 original volume. Thinly slice the beef and serve with individual servings of au jus for dipping. Leftover roast beef ? Use for making French Dip Sandwiches! 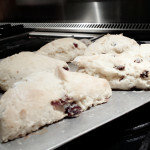 Fresh baked scones are a warm welcome every morning! The dough will be sticky. Stir until dough thickens and pulls away from edge of mixing bowl slightly , sprinkling in a little more flour if needed. it becomes easy to handle but is still very delicate. Divide in half, patting gently to form two circles. Cut with knife into 8 wedges. Use flour on knife if it’s too sticky to cut! Arrange wedges on an un-greased baking sheet 1″-2″ apart. Wondering what to make your family on a chilly January afternoon? 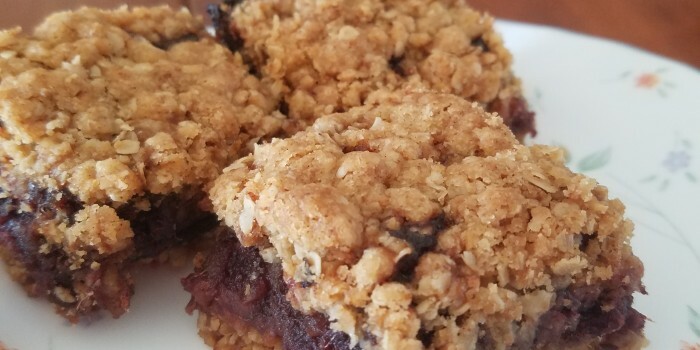 Try this simple recipe that’s nutritious and easy to make . All you’ll need: red lentils and an onion. 1. Add 1/2 chopped onion to a teaspoon of olive oil and saute for 3 minutes on medium high heat. 2. Add 8 cups cold water and 1/2 cup red lentils. Stir lentils, onions in 8 cups cold water. 3. Bring to a boil stirring constantly. Reduce heat to medium high. Cook for 45-50 minutes or until the onions are very, very soft and lentils are mush, stirring occasionally to prevent scorching. 4. Skim off the foam and discard. Serve warm with fresh crusty bread. My kids like to add hot sauce to spice it up! 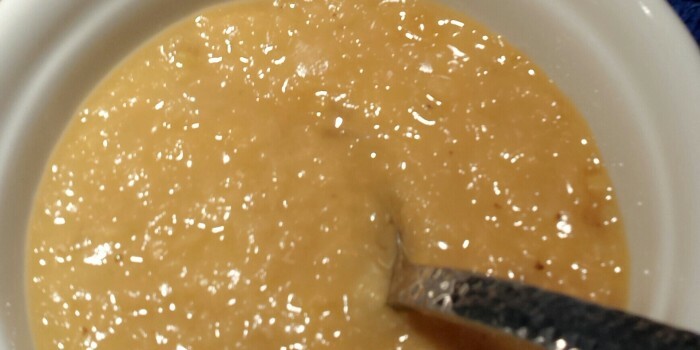 For a smoother version of this soup, purée in a blender. This traditional Turkish Wedding soup can be prepared by adding fresh mint. Double this recipe for 4 servings. These are signature cookies in the Kerr households around the holidays. Grandma always made them with a tiny cherry on top, so I do, too. 3. 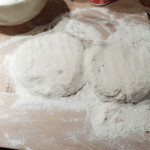 Add flour gradually, besting with a spoon after each addition. Beat until the mixture is light and looks like whipped cream. 5. Roll out the dough on a floured board until it is 1/2 inch thick. 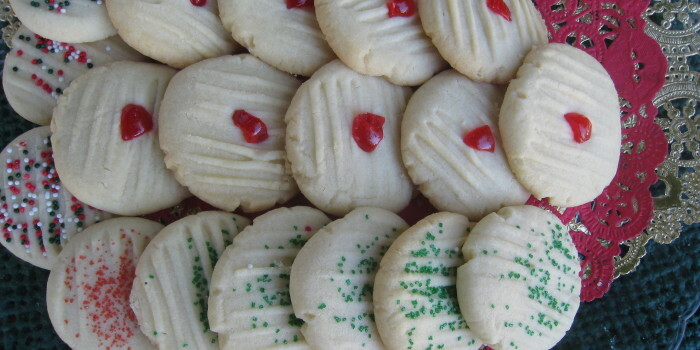 Cut small round shapes with a cookie cutter or use the rim of a small drinking glass. 6. Arrange the cut cookie dough on an ungreased baking sheet. 7. Bake on the middle rack of the oven for 15 minutes or until golden around the edges. Do not over bake. 8. Cook on the baking sheet for 1 minutes, and them remove the cookies to a wire rack to cool completely. 9. 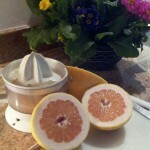 Serve immediately or store in an airtight container for up to 4 days. Freeze for up to 2 months. 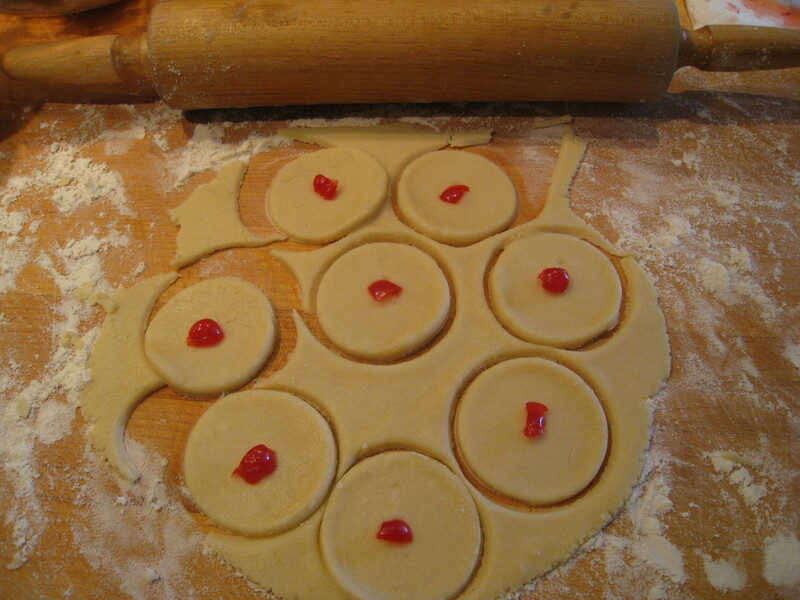 TIP for thicker cookies roll the dough into small balls by hand and arrange on an ungreased baking sheet. Flatten with a fork. 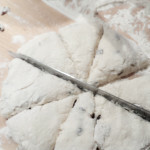 To decorate the cookies use a sliver of candied maraschino cherry or a pecan gently pushed into the center of the dough very gently before baking. Or, for a festive look, sprinkle colored candy pieces, gently pressing into unbaked cookies before baking. This traditional comfort food can be served piping hot from the oven on a cold winter evening, or warmed up the next day. 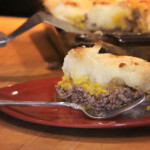 When I was growing up in Quebec, This recipe was a filling and thrifty meal for a large family. Serve with pickled beets, iceberg lettuce salad, and warm crusty bread. 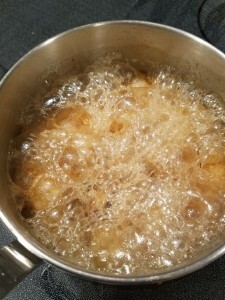 Add potatoes to a pot of boiling water and cook on medium high until tender, about 20 minutes. Drain. Mash the hot potatoes with a potato masher. Add butter and some of the milk and mash again. Beat with an electric mixer, adding just enough milk to whip the potatoes until they’re fluffy. Cover to keep warm and set aside. In a heavy skillet on medium, heat the oil and sauté the onions for 3 to 4 minutes. Transfer the onions to a large mixing bowl and set aside. Using the same skillet, cook the ground beef with the salt and pepper on medium-high heat until no longer pink, crumbling the beef with a fork as it cooks. 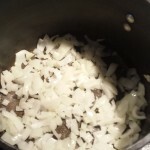 Transfer the beef to the onion bowl using a slotted spoon to drain off any fat. Mix well. 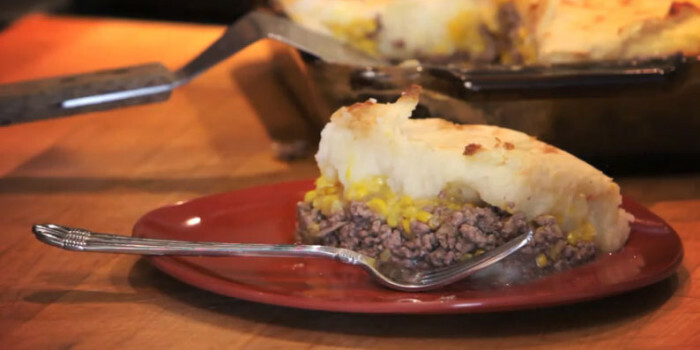 Line the bottom of a 7- x 11-inch baking or casserole dish with the meat and onion mixture. Pour the creamed corn over the meat. Spread the whipped potatoes evenly on top of the corn, right to the edges of the casserole dish, forming a crust. Use a spatula to make peaks on the potato crust for a decorative look. Dot with butter. Bake, uncovered, until the potatoes are golden brown, about 30 minutes. Broil for an additional 5 to 7 minutes, browning but not burning the top. o TIP Place a baking sheet under the casserole dish to catch any spills.